What are the different vernier caliper types? In metrology, Vernier calliper is a precision measuring device used to measure the dimensions of the workpiece with high accuracy and precision. The construction and working principle of vernier caliper is explained in the previous article (Click here). In this article, we are going to discuss the different Vernier Caliper types. According to Indian standards, there are three vernier caliper types. The first one is with jaws on both sides for external and internal measurements and it has a needle for depth measurement. The second type, In this type f vernier caliper there are no separate jaws for internal and external measurements. one set of jaws are available for both internal and external measurements. 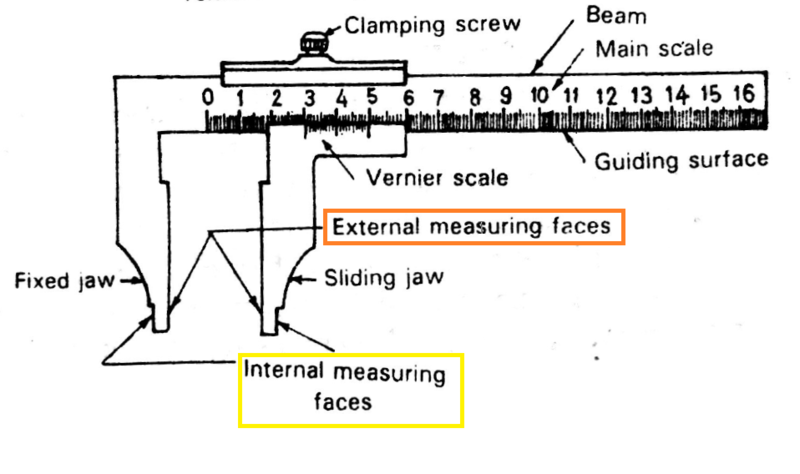 the measuring faces of the jaws in this type of vernier caliper are suitable for taking both internal and external measurements. The minimum internal measurement should be greater than the total width of the jaws when they are together. then only the internal measurements are made by adding the width of measuring jaws to the reading. For example, If we want to the measurement of the diameter of the hole of 1.3 centimetres approx, and the width of two jaws when they are together is 1 cm, it is possible to take the measurement. The reading will be shown as 0.3 centimetres on the vernier caliper, and we will add the width(1 cm) to this reading then it will give the actual reading 1.3 centimetres. and it will have knife edges for marking purpose. Vernier Height gauge is used to measure heights. 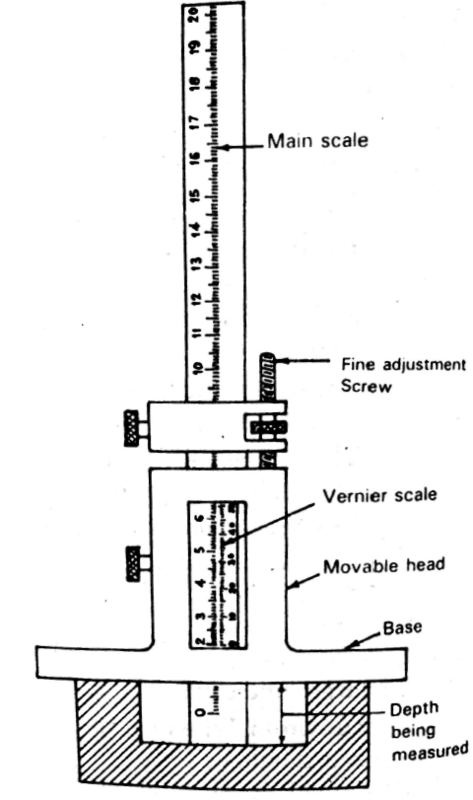 Vernier Height gauge is similar to vernier caliper, but the graduated scales are held vertically. and this Vernier height gauge used in conjunction with a surface plate. Vernier depth gauge is used to measure the depth of the holes, slots.